Good God. Can somebody elongate the word ‘rumble’ for me so that it lasts for the duration of this post? 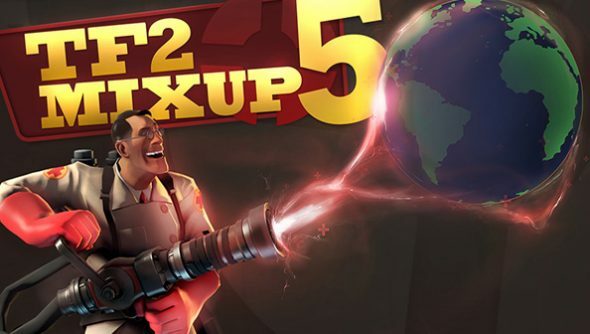 TF2 Mixup 5 is in the offing, and brings together some of games development and internet culture’s finest voices and minds. After that, it has them blow the bananas out of each other. The 9-on-9 match is in aid of Doctors Worldwide, the charity which works to provide sustainable medical relief and health-based development programmes in emergency situations throughout the world, and will take place in early December. When exactly is a big secret “in order to avoid attacks on the server and players”, because that’s the sort of internet we live in. But we do have a list of players, including Mojang head and beard-master Notch, internet sensei-shun Zonday,StarCraft commentator and positivity coach Day, both Yogscasters and a troupe of top developers. You’ll note there are also three blank spaces, with winners to be decided via a raffle. The more you donate, the higher chance you’ll have of being shot in the head by Markus Persson. Will you be entering?